Ferrari say they were worried about Kimi Raikkonen's engine before it blew up in Sunday's European Grand Prix. The defending world champion's race ended on lap 46, leaving him 13 points adrift in the drivers' standings. But Ferrari say they had to take a calculated gamble, as any change of engine would have forced Raikkonen to start well down the grid. "The engineers were aware of a potential risk with Kimi's engine," Ferrari said on their website. "Changing the engine on Kimi's car would have seen him start from far down the grid at a track where it appeared that overtaking was impossible. "(It proves) it's not enough to bring Formula One to a street circuit in a fantastic location to produce spectacular racing." 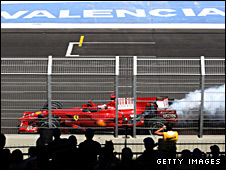 The engine failure for Raikkonen came hot on the heels of a similar problem for his team-mate Felipe Massa in the previous race in Hungary. Raikkonen's engine was on its second race at Valencia and used con rods - which connect the piston to the crankshaft - from the same batch as those used in Massa's engine. Lewis Hamilton, who finished second behind Massa on Sunday, now has a six-point championship lead over the Brazilian, with Raikkonen another seven points back. But Ferrari have denied reports that the Finn is under pressure to perform after a run of eight races without a victory. The 28-year-old overhauled a 17-point deficit to take the title from Hamilton last year and he has been backed to deliver again. "Of course, it's easy when things are going well. "Everyone close to you puts their arms on your shoulders to say you are number one, but then suddenly, when you have a difficult situation, they (laugh) and say this is already finished," team principal Stefano Domenicali said. "That's not the case with Kimi. He's the world champion, we are a team, and of course we will support everyone in the team, and above all, of course Kimi. "We trust him 100%. It's in the difficult moments that the team has to stay together. "We don't have any doubt at all about Kimi's performance and I'm pretty sure he will come back between here and Brazil."